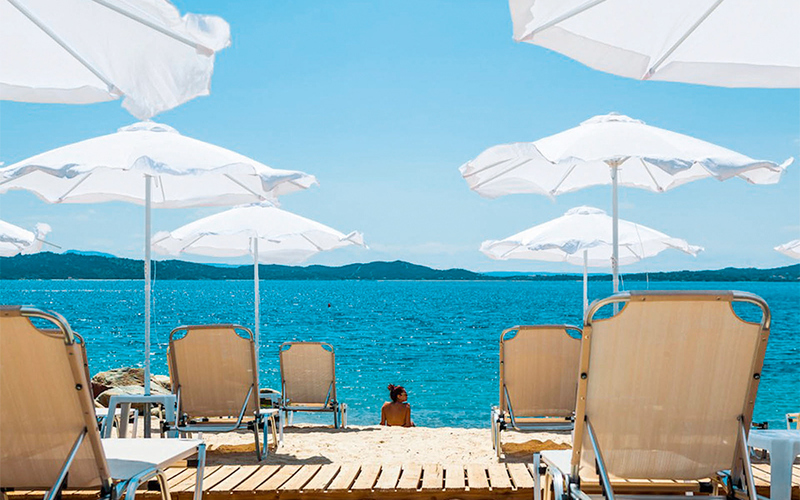 Blue flags are awarded to beaches with pristine waters as well as easy access and amenities. Here are some of our favorites from the 2017 awards. 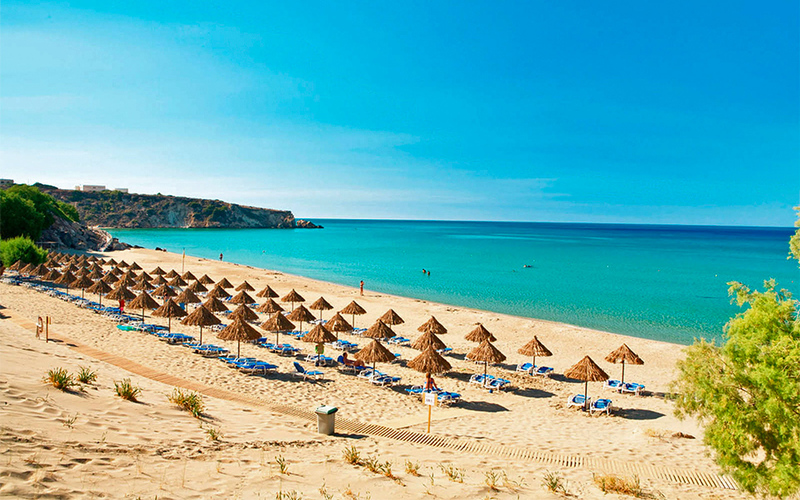 Located 24km east of Ierapetra on the southern coast of Crete, the beach of Lagoufa in Makrygialos is one of fine, golden sand and gorgeous waters. The beach is in front of a large hotel (but is accessible to all) and has all of the amenities including bars, showers and water sports. 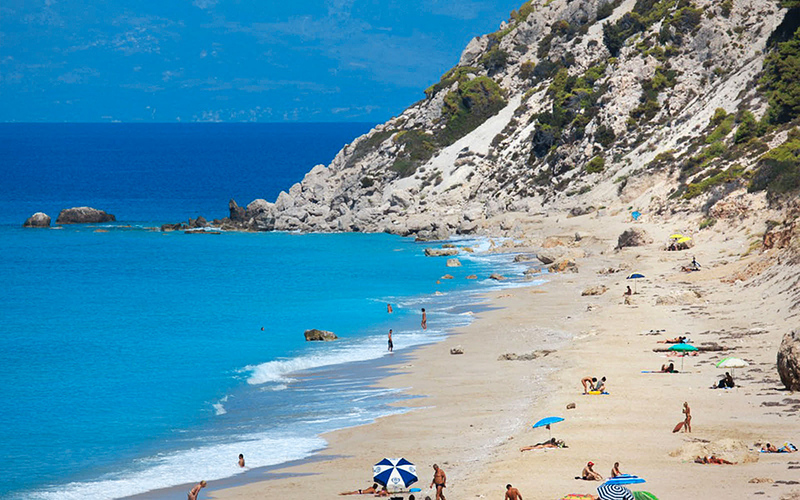 Located 15 km southeast of the main town, Kathisma is a huge stretch of fine sand, located close to the village of Agios Nikitas on the western coast. On this side of the island it is worth sticking around until sunset. To the west of the there is nothing but open water until Italy, meaning that the sun hits the beach until late, sinking directly into the sea. Be aware that when the wind blows from the west, the seas here get rough. 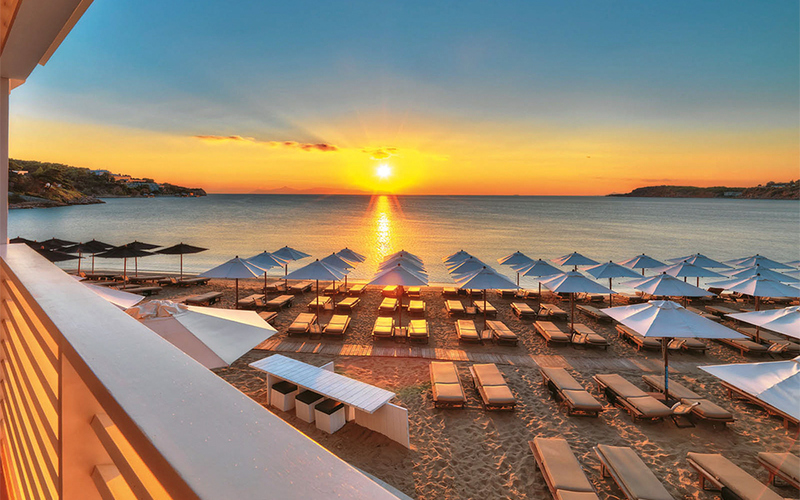 Athens' top luxury beach experience, Astir is located in the southern suburb of Vouliagmeni about 30-40 minutes from the center. Unlike most beaches in Greece one needs to pay an entrance fee to get in (and it's not cheap at 18 euros during weekdays and 28 euros on the weekend for adults). 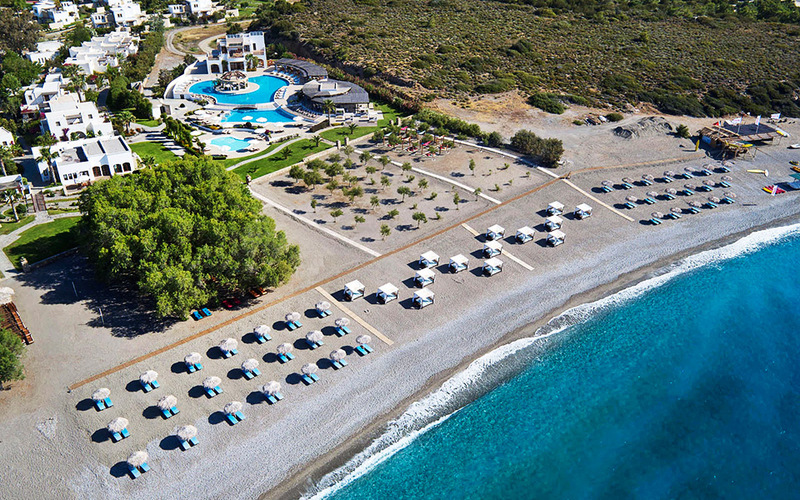 However the beach, run by the nearby Astir Palace Hotel, strives to offer the best in terms of high-end services with comfy sun loungers, good service and all the amenities. Come here for a bit of pampering (and plenty of fascinating people watching). Ios may generally have developed a reputation as a 'party' island but the beach of Magganari, is very quiet and child-friendly with shallow waters and sand perfect for sand-castle building. The beach actually consists of two coves that connect to a small rocky headland via a narrow spit of sand. The bay has 2 tavernas from where you can buy drinks and food. 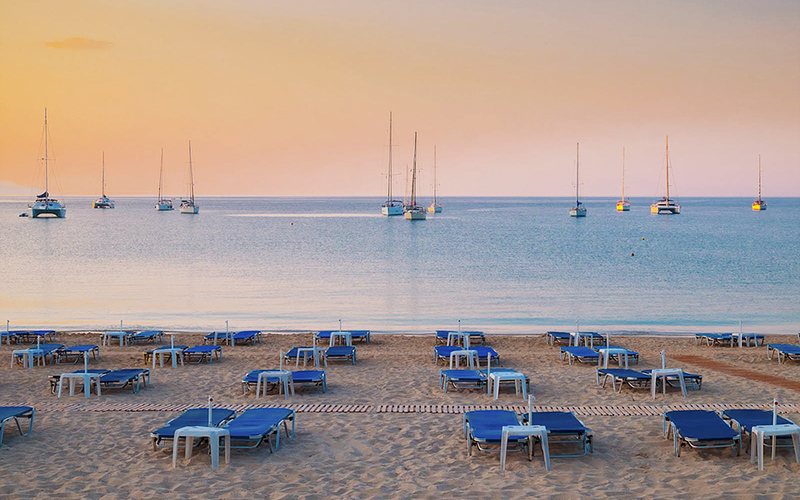 Porto Karras, is a very long, sandy beach (approximately 2km) with multiple beach bars and organized sections, as well as free areas where bathers can sit under the trees. Located just off the waterfront is also the Porto Carras Grand Resort with two five star hotels, a casino, spas and even an 18-hole golf course right next to the sea. 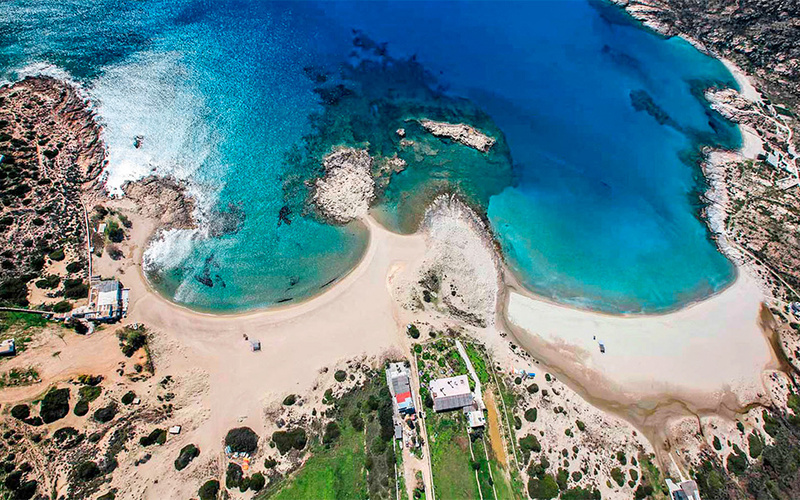 Located only 4km from the main port of Naxos, Aghios Prokopios is a one of the longest and most popular sandy stretches on an island that has more than its fair share of them. Several sections of the beach are organized with all the amenities while there are also plenty of spots towards the western end where you can get away from the crowds. The beach is also relatively protected from the stiff northerly meltemi winds that blow regularly in the summer. Plenty of water sports are also on offer here. 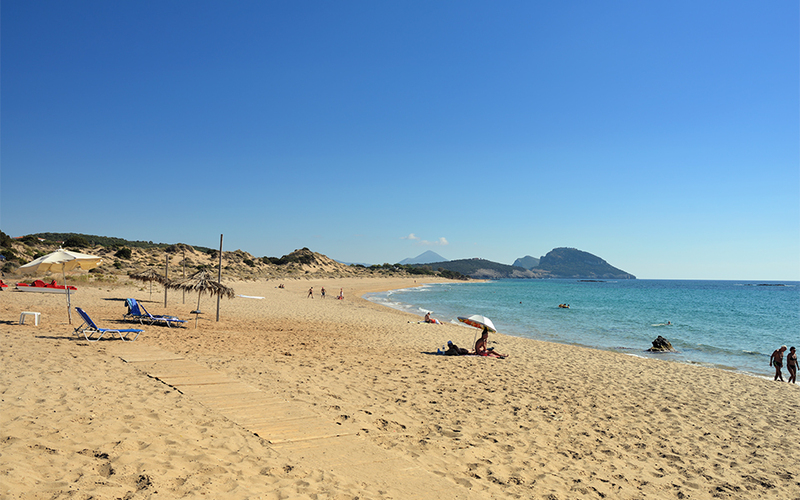 The beach closest to the Costa Navarino Resort, this huge 3km sandy expanse has umbrellas over only a relatively short length. A surf club also operates on the beach (Surf Salad) offering surfing, windsurfing and kitesurfing lessons as well as beach yoga and standup paddleboarding. Agia Fotia is a quiet, pebbly beach that is a favourite among locals. 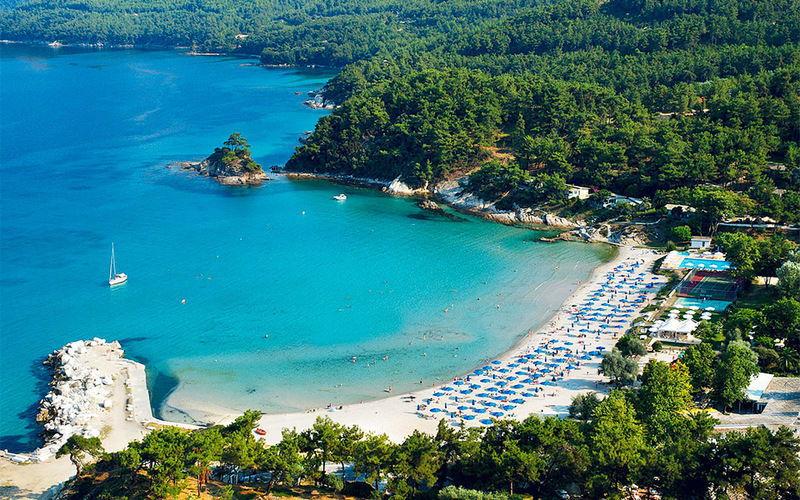 The bay is very picturesque, backed by high mountains and featuring tall cliffs topped by pines and olive trees. The crisp clean waters get deep quickly and the bay makes for interesting explorations with a mask and snorkel. Beach volleyball is also available. 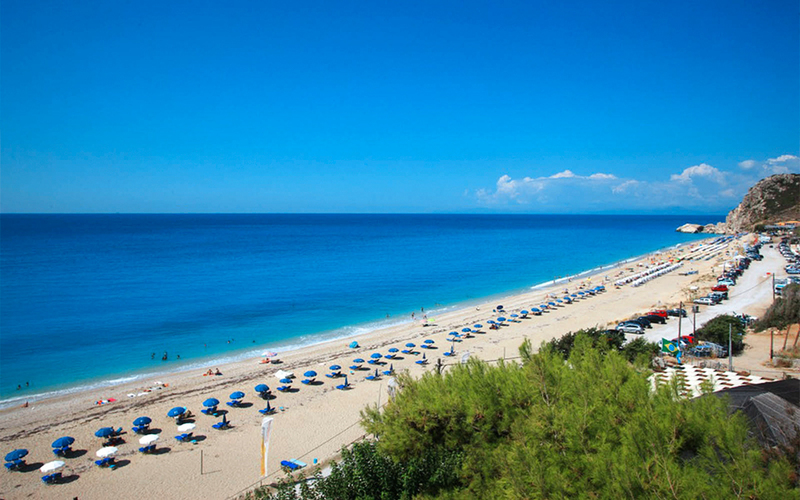 The majority of the easily accessible and organized beaches on Lefkada are located on the more protected eastern coast. Pefkoulia is an exception – a long sandy stretch on the more rugged western coast located near the village of Aghio Nikita. Tavernas and a cafe located near the beach mean refreshments are easy to find. There are also a limited number of umbrellas and sun-beds although during peak season these fill up quickly. When a westerly breeze picks up the beach is pummeled by sizeable waves. 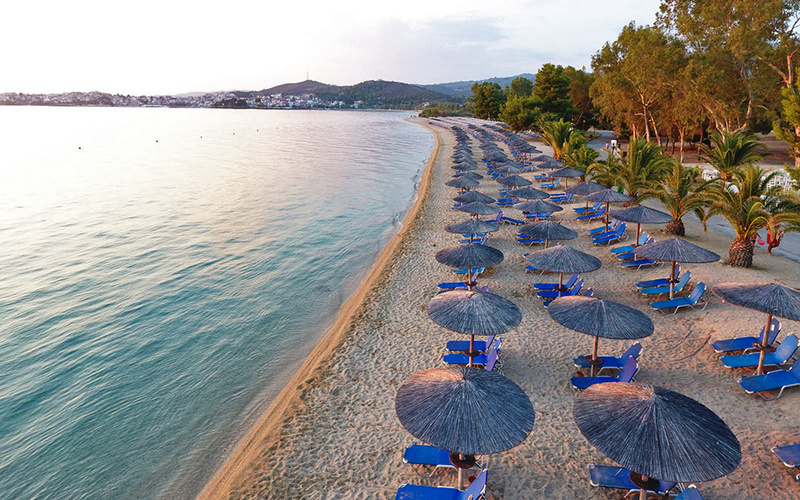 Its length of 2km means that Aghios Pavlos in Halkidiki has plenty of legroom even during the height of the summer. The more popular sections of the beach are fully equipped with umbrellas and beach bars but for those who simply want to get away from the crowds there are plenty of quiet stretches. 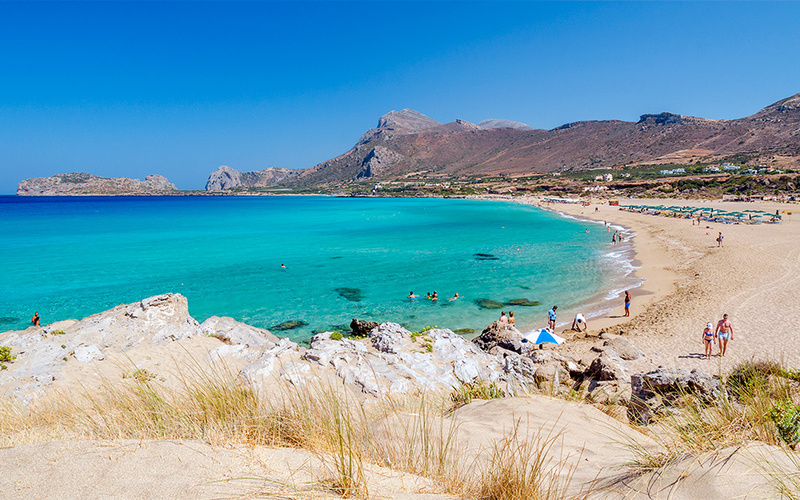 If there is one beach that best combines organized sections with wild beauty it is Falasarna located on the western coast of Crete, 59km west of the city of Chania. Famed for its sand that is curiously pink in places and turns the sea remarkable shades of blue, the beach has been named one of the 10 best beaches in Europe. 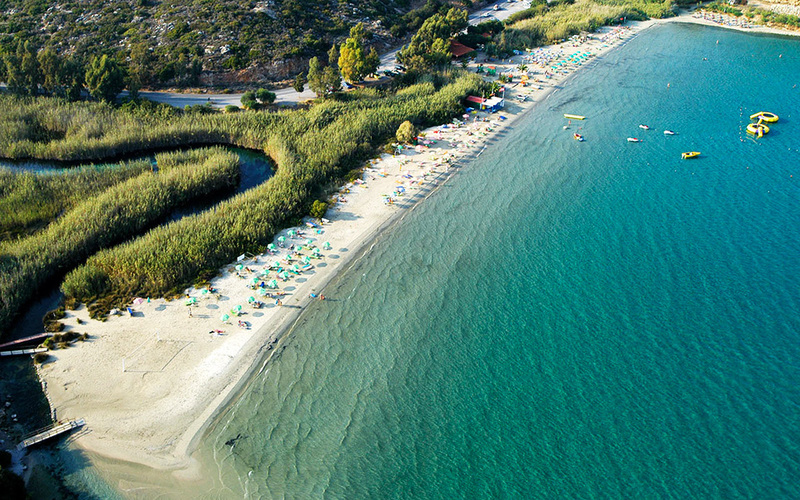 Lardos, is a very popular beach and is considered one of the best on Rhodes. Aside from the usual amenities there are a wide range of water sports available and even a go kart track for some friendly racing in between swims. Also worth visiting are the nearby ruins of a Byzantine castle. 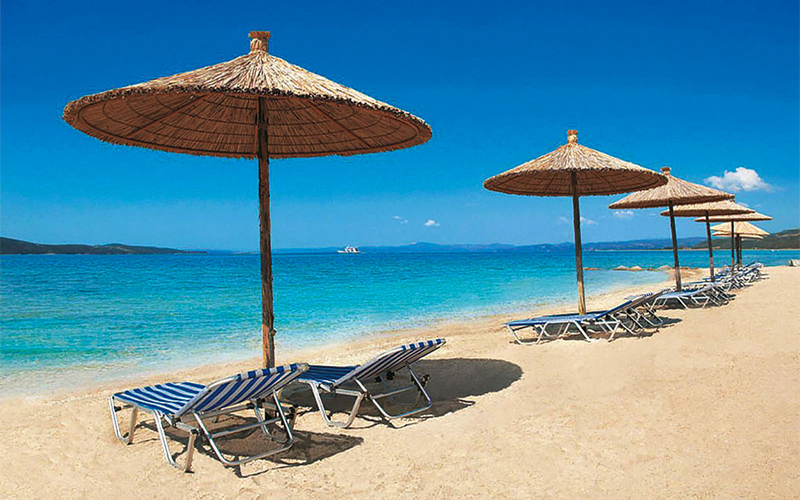 This beach located near Ouranopolis on the third peninsula of Halkidiki has a history in earning blue flags. It has an easy road access and covers an large area, with shallow waters good for kids. 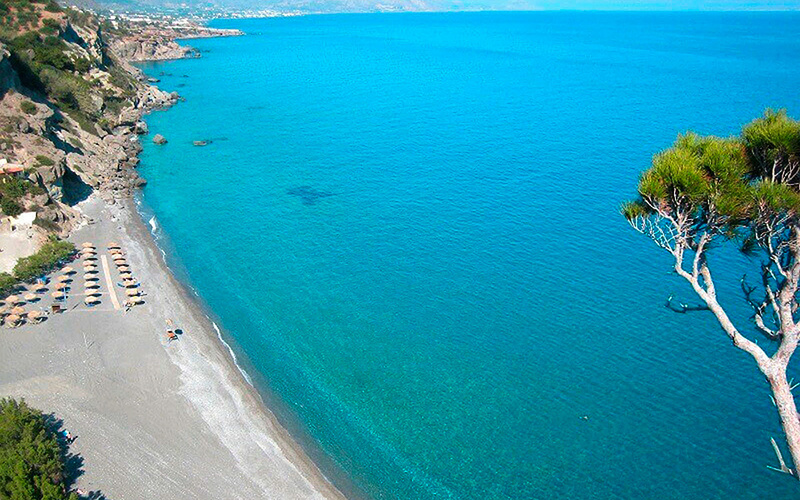 Almiros beach is located 2.5km south of Aghios Nikolaos in the region of Lasithi in eastern Crete. Near the beach is a protected wetland, with rare birds and palm trees. The waters are usually calm, so it is an ideal destination for young children. Looking out over a beautiful bay, Makryammos near the northern mainland town of Kavala has fine white sand which lend the waters an emerald hue. The beach is also surrounded by many trees, bestowing the bay with a peaceful atmosphere. 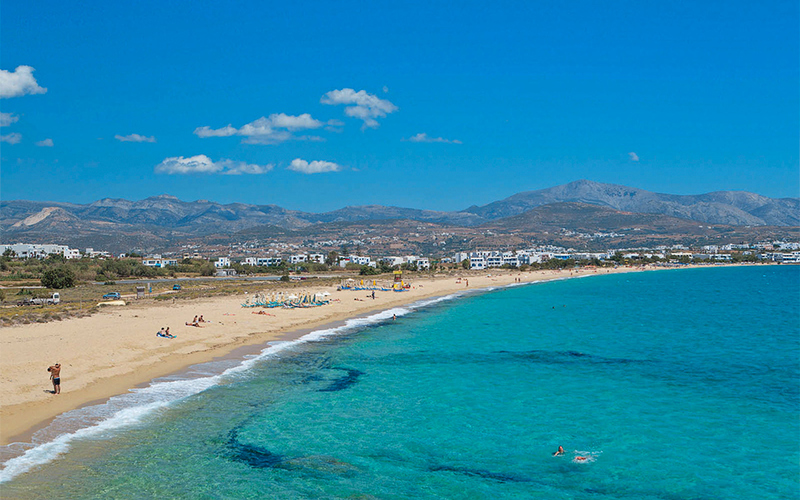 Platanias is the main beach of the town of Rethymno, located on the northern coast of Crete. 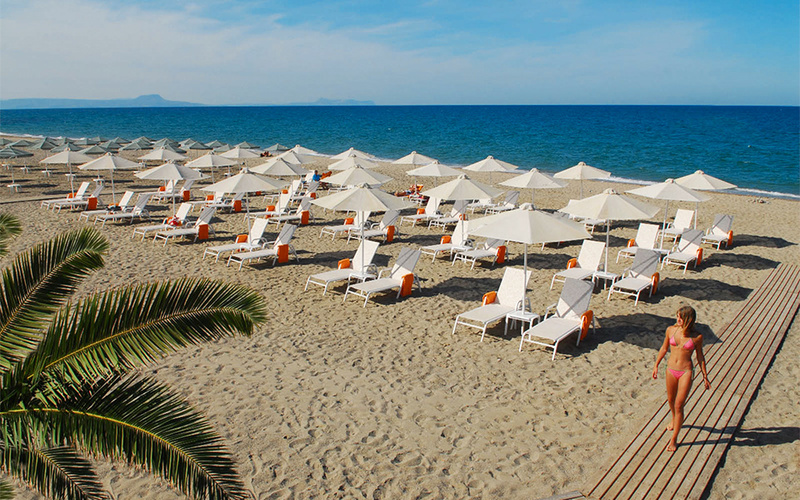 Located as it is next to one of Crete's main cities, unsurprisingly the beach has a a large number of bars and cafes renting umbrellas on the sand, as well as number of hotels. While it is a popular swimming spot for the locals, its sheer size means that one can always get away from the crowds. The beach is exposed to northerly winds and when these blow strong currents develop so it is wise to stay in the areas protected by lifeguards. Valtos beach is located near the town of Parga on Greece's western coast. It can be reached with many ways, but one of the most charming is by water taxi. A great destination for families with kids.